At the Beauchamp Foot Care Clinic in Knightsbridge, London, one common problem we come across time and again is the dreaded recurring verruca. People use widely available topical treatments, often bought in pharmacies and supermarkets, that might get rid of the unsightly verruca for a while but then they are dismayed when it returns within a few weeks or months. First of all, a verruca is pretty common. They’re easy to contract and also quite difficult to get rid of, especially with standard off the shelf products. While a verruca is unsightly, it can also be pretty painful making standing or walking uncomfortable. Left untreated, the infection can spread across your foot. If you are having problems with returning verrucas, there are a number of simple things you can do to reduce the risk of falling victim to another infection. 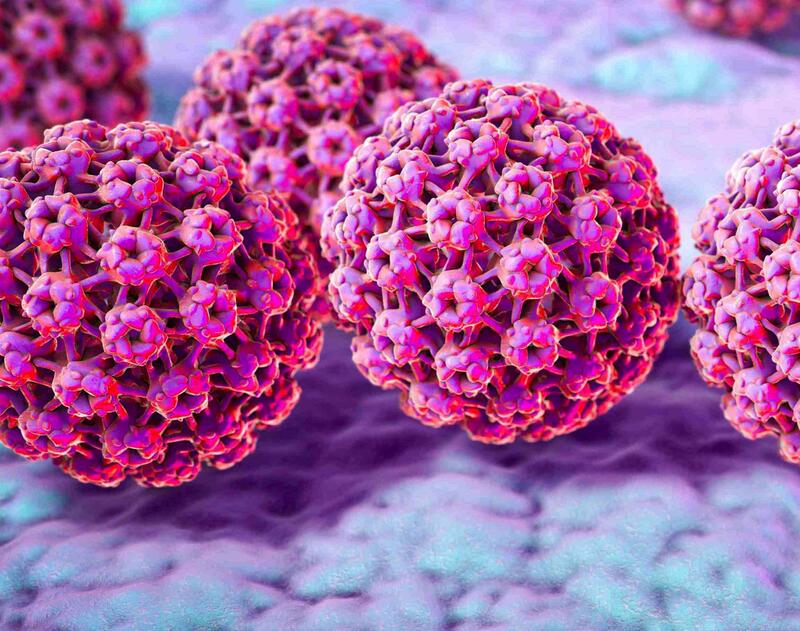 A verruca is caused by the human papilloma virus (shown here) and can be picked up easily, so avoiding some activities can help protect you. Don’t walk barefoot on surfaces where there are lots of people around. For instance, if you’re poolside on holiday, putting on a pair of flip-flops or other footwear can help keep you protected. If someone in your family has a verruca you can reduce the chance of getting one yourself by ensuring they wear protection over the infected area. Another thing you can do is keep your own towel – sharing with someone who has a verruca is the quickest way to transfer the virus. Even if it’s just for wiping the sand off your feet on the beach, make sure you keep your towel private. If you are sharing a shower with someone who has a verruca, cleaning the area after use should get rid of the virus and stop cross infection. One method that’s used quite regularly, especially by podiatrists, is to freeze the verruca using a method called cryotherapy. This uses a small amount of liquid nitrogen to destroy the tissue of the verruca but can still take a number of treatments before it’s successful. Another option is to use laser treatment which can target the verruca without impacting on the surrounding tissue. Again, this might need more than one treatment but should successfully remove the infection. The other, perhaps more drastic option, is to have the verruca surgically removed. This can be a little more painful than other choices and is not certain to remove the papilla virus that caused the verruca in the first place – which means it can return. At our Beauchamp Foot Clinic in Knightsbridge, we’ve been getting successful results recently with a safe, topical application called Spirularin VS®. If you have a problem with returning verrucas, this prescription medication can help protect your feet during the day and has been shown to work on even stubborn cases. If you are having problems with a verruca, it always pays to visit a professional podiatrist who can assess your condition properly, discuss the various options and make the right recommendations for your individual needs. Contact the team at Beauchamp Foot Care in Knightsbridge today to book an appointment.